So, one Sunday I promised myself we will have a nice roast at home. Claire and I were going to see a man about an allotment, which we took (we’re becoming Tom and Barbara from The Good Life). This meant we need to get various gardening implements, as well as seeds etc. After this adventure, I realised that it was 12:30 – lunch time! 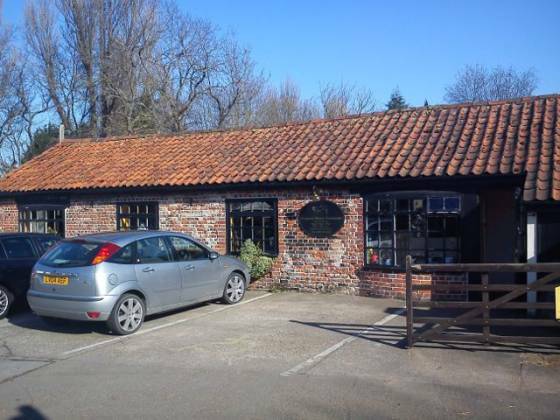 Next to the Thompson Garden Centre was a equine stable, animal food shop (food to feed animals, not a butchers) within Frogpool Manor Saddlery and also a tea room/restaurant. We have been here a couple of times before, including a couple of Vickers’ Christmas parties, so I was keen to review their lunches. Parking is very simple, there are a number of spaces in front of the restaurant. Walking through two sets of doors, we were greeted by someone at the till. I remembered they do not take card payment, only cash or perhaps a cheque. This meant me leaving Claire in the restaurant whilst I ran up to the cash point in the petrol station! Also, they do not take bookings, it is very much first come, first served. When I got back to Frogpool Manor Saddlery, Claire was seated at a small table next to a window. 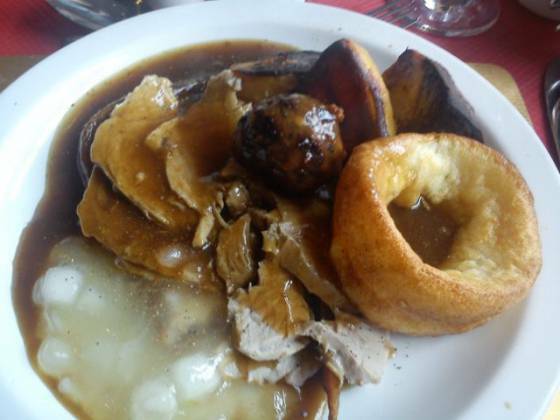 The menus were of simple fair – Roast Lamb, Roast Beef, Roast Turkey or Roast Pork. 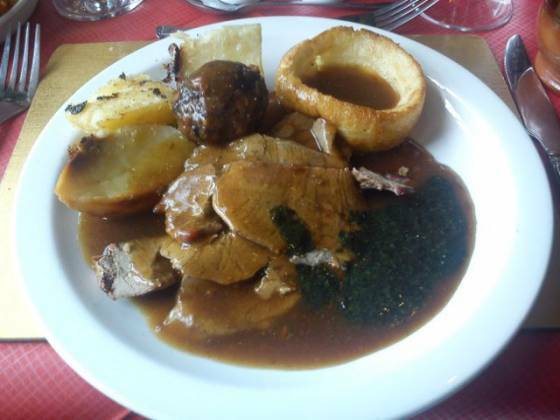 Claire decided on the Roast Pork, as I was once again hankering for mint sauce, I ordered the roast lamb. We were also asked what drinks we would like. Be aware that The Saddlery does not have a licence to serve alcohol, they do allow you to bring your own though I am not sure about a corkage charge. We both went for a can of diet coke. Looking around, I could appreciate the unusualness of the venue. Bare brick walls with stable or farming tools hanging up on most, a large fireplace with a chair and settee and classical-type music in the background. Unfortunately, there were no spectacular finishing touches, such as linen napkins, nice silverwear or even elegant menus (they were cheaply made). Our food came out fairly quickly, around 10 minutes after ordering. The plates served first, with our meat, roast potatoes, stuffing for me and crackling for Claire, as well as gravy already poured. A serving dish of vegetables came next, as well as Claire’s apple sauce in it’s own dish. On to the food review. My lamb was nice and chunky, a lot was there and it tasted very good. Claire ate the roast pork very quickly (well, for her anyway), which just shows how much she enjoyed it. We had 3 reasonably sized roast potatoes. They were a bit hit and missed. Some were extremely crunchy, others not quite so much. I did feel we were a bit stuck in the 1980’s, we had broccoli, (skin on) sliced carrots and sweetcorn. 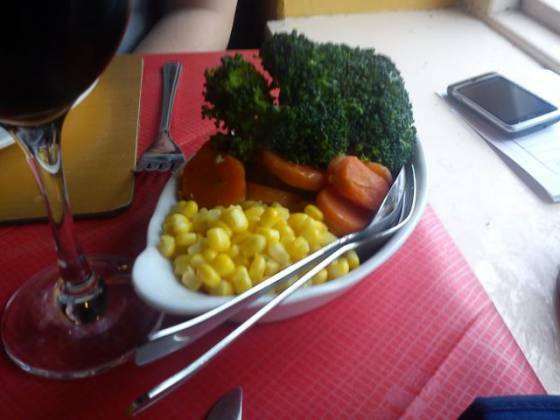 Now, I am not a lover of sweetcorn (in fact, I can’t stand it), so that left just broccoli and carrots for me. The floret was HUGE – all was cooked well, if a little bland. Both of us agreed that the Yorkshire pudding was very crispy and enjoyable. My slice of stuffing was ok, Claire’s crackling was put under the meat, so it soaked up the gravy and meant it was more just fat instead of crunchy. Claire said the apple sauce was nice, with large pieces of apple in it. We did have a quick perusal of the dessert menu – a lot of puddings were on offer, such as Bread & Butter Pudding, Apricot Crumble and Summer Pudding. I went for the apple and sultana cheesecake. A couple of minutes later, out it came – and what a huge portion! A very large slice of cheesecake and two scoops of icecream! 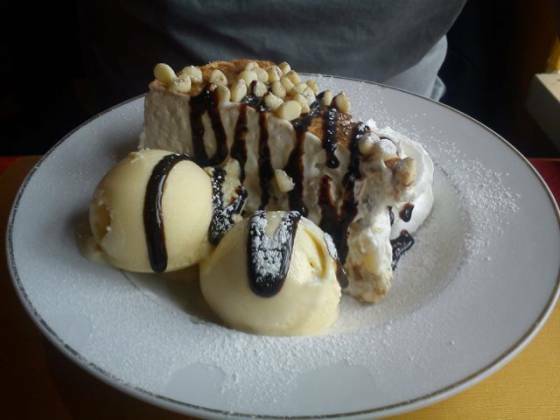 The cheesecake tasted very good (if a bit wobbly), but the ice cream was a strange combination – lemon! Quite nice, but the combination didn’t really match. A recommended lunch for a casual Sunday lunch with friends and family at Frogpool Manor Saddlery.